Laddertag Inspection System by Scafftag - the original, industry-standard ladder status system to control inspections, maintenance and identification. Ladder tags are used as warning labels and signs to increase safety awareness in the workplace by ensuring workers are informed of the safety status of ladders on site. 10x LadderTag holders - 'Do Not Use Ladder' printed on front. 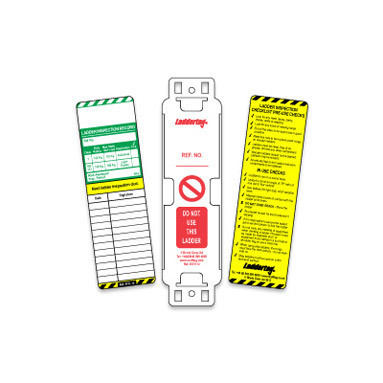 10x LadderTag inserts - to indicate the details of previous inspections. 1x fine permanent marker pen. Used by ISO9000 companies worldwide. Provides a clear inspection trail and ensures the user is informed of the status of the equipment. Product may vary slightly in appearance to image shown.